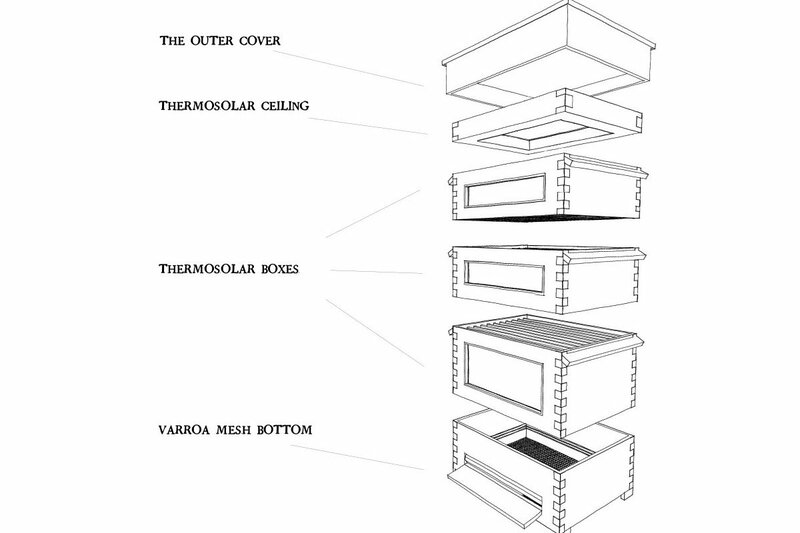 The Thermosolar Hive™ is a modern hive consisting of boxes, equipped with active surfaces, enabling changing the sunshine into thermal energy to warm the brood chamber. The outer cover is very well insulated (necessary precondition) and is similar to common types of hives. Thermal inertia of the hive depends on the insulation of the outer cover, and it is used to regulate the hive warming process. By removing the outer cover, we start the warming process of thermosolar treatment, by placing it back on, we finish the process. Thermosolar ceiling is a completely unique device. Basically it is a strongly insulated frame with active surface inserted. The surface is coated with special colour, which was being tested and refined for long time. Its specifics is an admixture which increases significantly the conversion ratio of varied shortwave light radiation into longwave thermal radiation. Without this key admixture the heating based on common colours is not ideal, and under the common light conditions the hive would not work. That would disable repeated treatment of bee colonies in the requested intervals and decrease the functionality of the whole system. That is why it is necessary to ensure high quality production and accurate compliance to recipe for composition of colours. Over this surface there is a system of glasses, which provides for strong greenhouse effect above the active surface, preserving great light transmittance. Thermosolar ceiling is not intended for increasing the temperatures for long time. Thanks to its high efficiency it is designed solely for thermosolar treatment of bee brood. The beekeeper activates the ceiling by simple removing of the outer cover. Thermosolar ceiling is equipped with integrated digital thermometers, which allow monitoring the treatment temperature constantly both in the upper and lower parts of the brood chamber. Thermosolar box is specific in several aspects. Firstly the front wall is narrowed considerably, in order to allow the sunlight permeate through the inserted window. Behind the window from the interior of the front wall, there is a metal sheet, coated with the above described special colour. In late summer, in the period of main thermosolar treatment, the drone comb is cut out, and the queen bees refuse to lay into the virgin comb after solstice. Most of the brood is therefore located in the single upper super, where it is possible to apply thermal treatment efficiently. The solar treatment is able to exterminate mites within the distance of 40 cm from the heat-radiating surface. If the brood was located in the lower supers, it would not be treated thermally there. Thus it is crucial for the treatment to meet the condition of placing all the brood inside the single upper super. The queen bees in the thermosolar hives usually lay eggs in a single, upper super, especially in the spring. As the warm air rises from the thermosolar frames, the mother bees lay eggs in the direction of this thermal gradient. To insulate the thermosolar super, special thermo foils are used. It has to be insulated precisely to ensure complete air impermeability of the hive. Only 1mm of this foil is equivalent to 6mm of common polystyrene. Common supers, well-insulated as they may be, never reach this strict key standard. The warm air has high ability to dissipate through the walls of the common supers. Therefore it is not possible for the common supers to reach the treatment temperature and preserve the temperature for the whole necessary time of treatment. That is also why special attention is paid to insulating the glasses in the supers of thermosolar hives. The supers include tight closable eyelet and haptic bars. Outer shade is quite essential, it may be used to screen the front wall and disable the solar heating, which may be useful for example on warm winter days to prevent further increase of temperatures from activating the bee colonies undesirably, or not to overheat the divide with the young mother bee during hot summer. The shading effect may be utilized in hot summer, when solar heating could be counterproductive. Thermosolar super is also equipped with a sealed divide for breeding mother bees. One divide is supplied with each thermosolar hive. Varroa bottom is designed similarly as in other modern beehives consisting of supers. It is specific with insulating lining though, which prevents heat loss during thermal treatment. Treatment would not be so efficient without the specially lined varroa bottom.